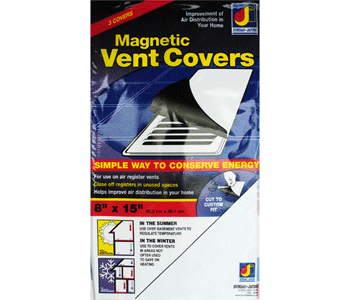 8 x 15 Magnetic Floor Vent Cover Discounts Apply ! Magnetic register covers are a great way to improve the energy efficiency in your home by controlling air flow. Block vents in rooms that you don't use, or rooms that may get too warm or cool. Magnetic register covers can be cut to fit smaller floor register openings or unusual shapes. 8 x 15 magnetic sheets to block vents are also ideal for use in commercial as well as residential use. Floor magnetic register covers are sold in sets of 3 and have a white finish. Block vents with these magnetic floor register covers that are a quality American made product. Reminder: These magnetic register covers are only meant for steel floor registers and grilles. Order these magnetic register covers that block vents to make your area more energy efficient. Order today and start saving money!